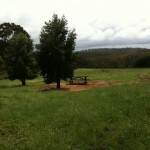 In November 2011 I decided to ride the newish section (launched July 2011) of the Munda Biddi Mountain Bike Trail, from Manjimup to Dwellingup. All up a track distance of about 400km. Originally I had decided to walk the section of the Bibbulum Track from Walpole to Albany, having earlier in the year completed the 7 day Denmark to Walpole section (well almost, got rained out on the last afternoon so missed the last day from Parry’s Beach to Denmark). However the cooler weather that had been forecast (I had thought it might be a bit too warm at that time for riding, I don’t like heat much), plus the fact that I could then also meet my wife in Dwellingup on the last day for my 55th birthday (November 11th, and then spend the weekend there in a holiday house), caused the change in plan. 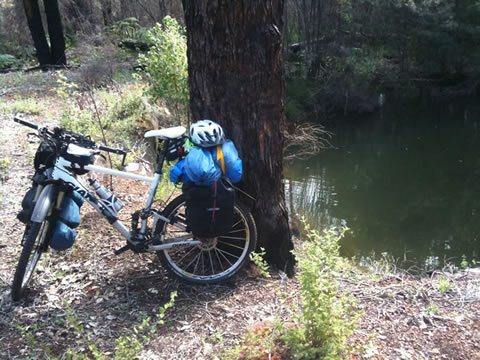 I had some previous experience with the Munda Biddi track as I had ridden (solo) the section from Jarrahdale to Dwellingup, via the Waterous route (7 days) in 2009, and also later on the Waterous route a couple of times as a 2 day overnighter. 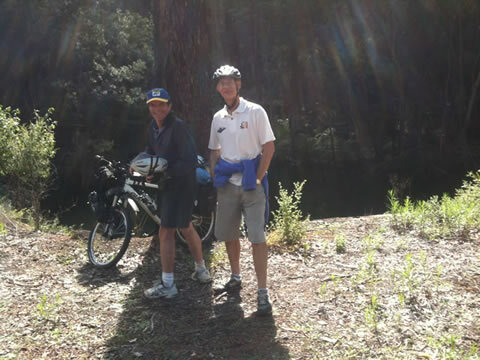 In November 2010 I participated in the 8 day Margaret River Cycle Trek, however this was a supported (no gear to carry), group (someone to talk to and provide motivation), semi-gourmet (lots of good food and drink) style event. 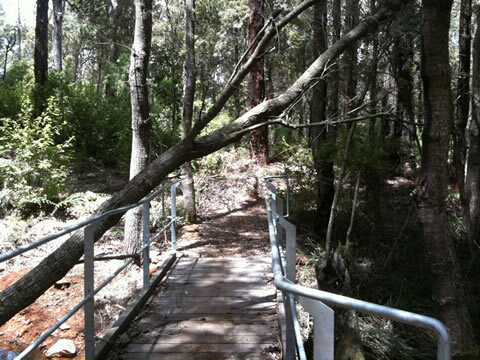 So although the Margaret River Cycle Trek was a bit challenging physically, one didn’t need to do much planning or thinking. This trip would be solo (sometimes you just need to get away from it all and challenge yourself a little), and my estimation was that it would take 8 days, based on the Munda Biddi maps’ suggested ‘standard’ day rides, between huts, etc, of about 45-65 km (obviously this might vary depending on how keen, fit, mad you are). Well, not a lot I guess. 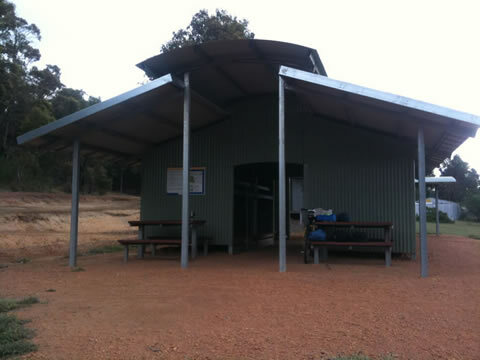 From previous experience (2009/2010 rides) I knew I could manage standard Munda Biddi hut to hut days (and when carrying gear). I ride my mountain bike to work most days, a 20km round trip, but this was about the limit of my training for the trip. I did load the bike up with most of the gear a few days before I left, and ride to work. This was mainly to test out the bike and load combination, but also provided a (tiny) bit of fitness training. I considered myself fairly fit, and felt I could manage the 8 days, even if it took a few days to get up some stamina. [Aside: in hindsight, this turned out to be the case. The trip was not overly difficult, perhaps 6 hours a day of riding per day (and I don’t ride that fast), although I did walk up many of the hills – I was carrying probably 20kg of gear]. Being a bit wiser and richer, I have started to buy more in the way of gear, both in quantity (I can afford to test a few things) and quality (always better to buy good gear if you can afford it). [Aside: on this ride I was reminded – you do a lot of thinking riding on your own – of Christmas 1976 when I was a 20 yo. A friend and I rode around New Zealand for 2 months – 2000 miles – on new Raleigh 10 speed bikes we had bought in Sydney, plus army surplus sleeping bags (those heavy cotton ones), a two man tent and backpacks. However we had little else in the way of gear or experience. We survived, and I have come a long way since then, but I still think that NZ was perhaps the best trip I ever did]. In preparation for the 2010 Margaret River Cycle Trek I decided to splash out a bit on a ‘new’ bike (I’ve lost track of how many bikes I have actually owned. 3 I think stolen, but over 30 years or so I guess that isn’t too bad, if not a bit sad). My bike up to then was a 2009 24 speed Mongoose Sabrosa hybrid bike, a good bike for the price, but mainly for commuting and with no suspension . 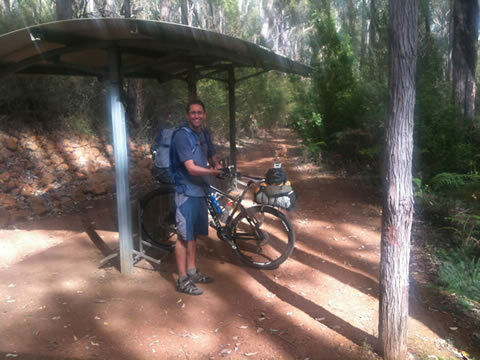 Having previously ridden this bike on the Jarrahdale to Dwellingup section in 2009 (lots of flats and bumps) I knew this was not what I wanted for the Margaret River Cycle Trek. So mid 2010 I started looking at mountain bikes. I did not have much (read ‘any’) experience with mountain bikes, but I started reading a bit and looking at bikes on the web and in stores, and on ‘second hand’ websites such as Gum Tree. I almost bought a few that would (in hindsigtht) not really have been what I wanted (e.g. downhill bikes, hardtails), but which at the time (due to my limited knowledge) seemed OK. Eventually I happened to come across a second hand Giant Anthem XO 2009 on the Perth Mountain Bike Club website ‘classifieds’. Now this bike was a bit out of my league, being basically a professional level XC mountain bike, with a RRP (at the time) of $6000+. However I had a look and a ride and a think, and the asking price (after a bit of negotiation) was $3000, for a bike that was less than a year old and seemingly in pretty good condition. So I thought ‘what the heck’, this will probably be the last bike I ever buy (given that I was approaching 54yo at the time, and not being pessimistic about being dead in the near future but the plan was to repair the bike rather than replace it), plus riding it to work will pay for it over a couple of years (had to justify it somehow). Of course my wife wasn’t too impressed – “You bought a $3000 bike, etc, etc?” – not that you can blame her of course. I rode this on the 2010 Margaret River Cycle Trek, plus a weekend trip on the Waterous route, and also have ridden it to work for the past year. So far I have found it to be just about perfect for what I need. I have however learnt a bit along the way, e.g. how to change tubeless tires, expensive bikes need expensive parts, etc. but haven’t looked back. For the trip I used Freeload racks on the back and front, from the New Zealand company of the same name (although I bought mine from Ground Effect, also a NZ Company, but they seem to specialise in bike related clothing). These racks are great (but perhaps not cheap at about Aus$150 each) and are perfect for suspension mountain bikes (at least those with alloy frames. Refer to Freeload’s website for their comment on carbon frames). They fit either front or rear and only take a few minutes to put on or off (once you know how). You don’t need any attachment points as they fit directly to the forks via adjustable webbing. Mine are the ‘Sport’ variety, but since I bought these Freeload have designed similar racks with ‘panniers’ in mind. Specifically for this trip I also bought some Ortlieb Front Roller Plus Panniers from Wiggle (UK). I had intended to put these on the front Freeload rack, but they were a little bigger (and heavier) than I expected, so instead I ended up using them as rear panniers, and tied my 1 man tent, sleeping bag and spares, etc, to the front rack. The Ortlieb packs are very well-made, sturdy and waterproof (but a bit heavy-ish). They also fit pretty well on the Sport variety Freeload racks, however it is worth securing them a bit with some shock-cord so as to stop them swaying (into the wheels) as you ride. [It is not much fun when you suddenly decelerate due to a locked rear wheel. I was glad I had a Mavic Crossmax wheelset, as the spokes are pretty heavy duty and while not indestructible are certainly stronger than the average. Otherwise I think I would have ripped a few spokes out the few times the panniers got stuck, prior to shock-cording them]. One of the first things I changed on my ‘new’ bike was the seat, those narrow racing style seats I just found uncomfortable. I tried a few different seats, and apparently finding the right seat is a bit of an art/trial and error. Eventually bought a Terry leather bike saddle, which has been fantastic. Having an 8 day deadline provided some inspiration for pre-planning (theoretically I needed to be in Dwellingup by afternoon of Friday 11th Nov, i.e. my birthday, in time to meet my lovely wife). However I would probably say I have a minimalist approach to planning. I don’t weigh everything to the nearest gram, nor do I prepare dehydrated food (not that there is anything wrong with doing this, and one day I might). 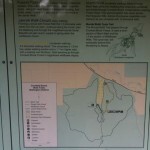 For this trip I did look at the Munda Biddi maps and write up a rough daily trip plan. This plan was somewhat limited as I didn’t get Map 5 (the new section) till the night before I left, so I had to guess a bit as to ‘how many’ days this section was. So off I left from Perth (Cockburn Central), about 2pm on Thursday 3rd November, via a South West Coach Lines bus to Manjimup (note: I was riding South to North to meet my wife in Dwellingup). 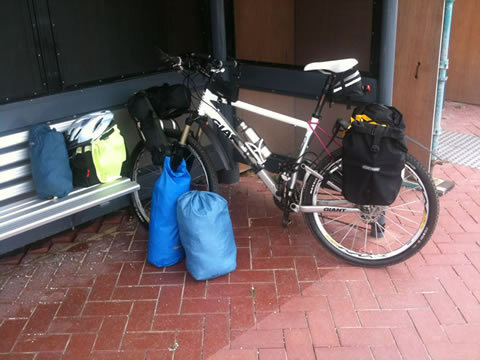 I had pre-booked a ticket, and I did ask about the bike in relation to storage (bikes cost an extra $20 to transport, all up about $70 to Manjimup). The salesperson was somewhat vague when I booked about whether I could just put the bike as is on the bus (in the storage area), and my impression was it would be OK, as is. So I did not prepare it as such for transport, i.e. put it in a box, take the wheels, pedals, etc. off (as I said previously, I have a minimalist approach to planning). When the bus arrived, the bus driver did not look too impressed (in fact I think he planned to ignore me, and if I hadn’t told him that I had a ticket he would have left without me). Eventually (after some discussion and – I imagine – under sufferance by the driver) we managed to get the bike in as is. I don’t blame the driver, as the bus was pretty full, there wasn’t much room in the luggage area, time was a-wasting, and he didn’t want the bike getting grease on other passenger’s luggage. 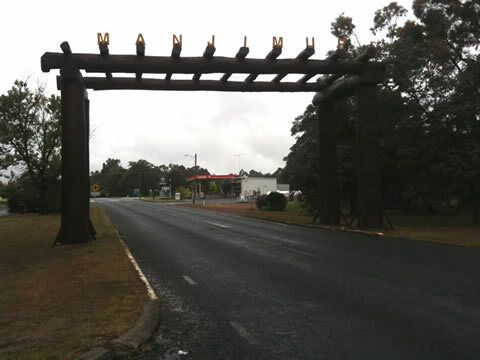 At Bunbury I swapped buses for the bus to Manjimup. Expected the worst (re. the bike) from the driver, but was somewhat surprised and pleased when he said, “great, chuck it in there” (or something similar). Of course this situation was slightly different, there were only about 6 passengers, there was plenty of luggage space and there was (it seemed) less urgency to get there (Manjimup). The driver was also only in his 20’s, so maybe he had a different perspective on things as well. Expecting an uneventful trip from then on, was surprised when one of the passengers (one of a pair of French tourists) soon announced that she had left her passport, money, etc on the previous bus (they had swapped buses also). This being perhaps every tourist’s nightmare, I had some sympathy. Fortunately so did the driver, who phoned ‘head quarters’ on his mobile, re: an interception of the other bus. It turned out the Bunbury leg involves a few stops, so we intercepted the other bus at SW TAFE, retrieved the lost passport, etc, and set off for Manjimup (with a couple of relieved tourists). 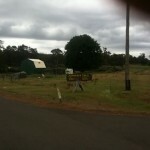 Arrived at Manjimup about 6.30pm. 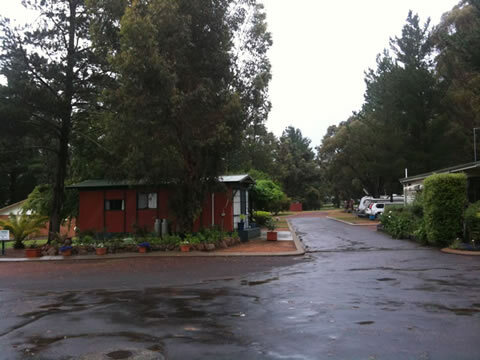 Had pre-booked to stay at the Warren Way Caravan Park, a very pleasant and bike friendly place. 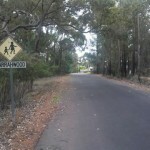 This is about 1 km before the start of town (if coming from Bunbury). I planned to check out the town first and then ride back out. Was surprised to find there was a ‘Subway’, open till 8.30pm or so, so bought a fairly healthy ‘footlong’ for dinner. The next day, well rested, the real start of the trip began. 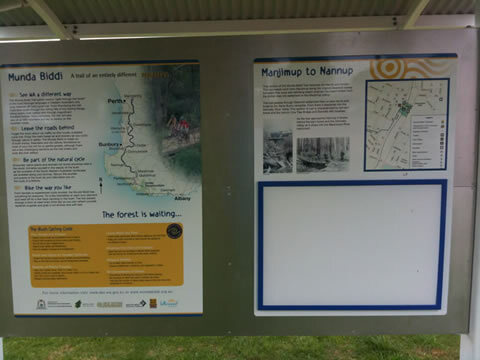 The official start of the Munda Biddi ride (north to Nannup in my case) begins in Manjin park in the middle of town (more or less), although in fact you simply keep riding down the main street till you get to the trail marker and the Dean Mill Heritage trail. 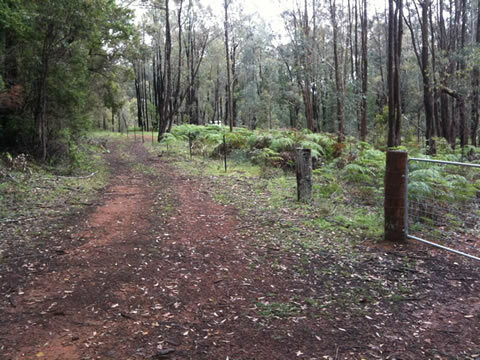 This trail is a pleasant and easy introduction for 7km or so, with a few hills just before Dean Mill (note, there is a public phone box there, you can see it in the photo below). 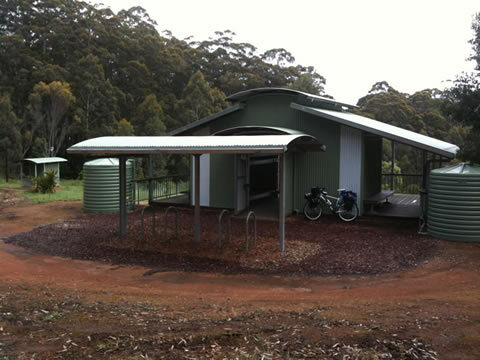 From Dean Mill there is some relatively easy mixed riding to the first hut – Karta Burnu – about 23 km from Manjimup. In my case it rained a bit on this leg, so arrived a bit wet at the hut at about 11am. The forecast however was for a clearer afternoon so I wasn’t too fussed about a bit of rain. I also came to my first challenge, a fence crossing. 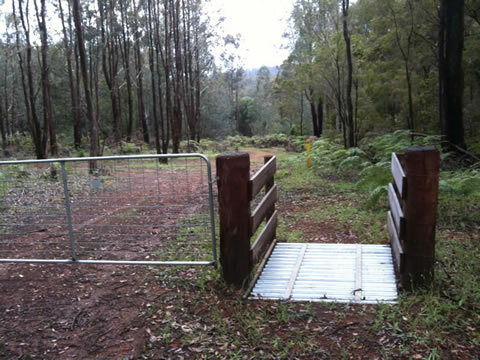 At the time I thought, “that’s a pretty fancy fence crossing for a farmer to put in”. Unfortunately I didn’t notice the yellow marker on the other side (you can see it in the picture behind the crossing) so kept riding along the obvious track, to the left (i.e. along the fence line as shown in the image below). Eventually I caught sight of the hut through the trees, but there was no obvious way in, so eventually I backtracked to the crossing. Of course, in hindsight, I wouldn’t have made this error if riding North-South (well I guess I might have made the same error at the first crossing), as I would have come across similar crossings already. Arriving at the hut relatively early meant I could have a bit of a break, i.e. dry off, have lunch and relax for a short while. 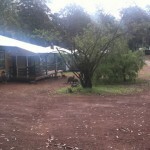 The MB huts are well made and are great overnight stops (although maybe only 1 star on the RAC accommodation guide). 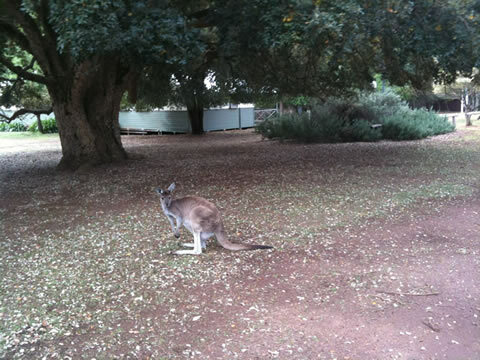 They are an open design and well suited to most south west WA conditions, although they may be a bit exposed in strong winds or a thunderstorm. For interest, there was no Optus network available (my iPhone), but my Telstra NextG Blue Tick phone worked fine. [Aside: I used to live in Canberra and used the Kosciusko mountain huts often while bushwalking and cross-country skiing – these were life-savers in extreme conditions]. 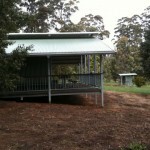 This hut has great views over the valley, and you can just sit on the deck and enjoy the environment. 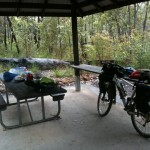 Checking the log book I found that a couple of guys had stayed the night before, riding from Manjimup the previous day. I didn’t expect to bump into them as they were heading in the same direction as I was, but half a day ahead of me (on my schedule). So I added a few comments to the log myself, and prepared to head off. I had planned to overnight at Willow Springs, as this was the next obvious camping site marked on Map 5. It was however another 35km or so and thus I had a way to go yet. Heading off from Karta Burnu there is some interesting riding along the Donnelly River, with a section of downhill switchbacks, plus some long up and down stretches through the forest, eventually bringing you to Donnelly Mill. Quite a nice section of the track. Remember those two guys I mentioned from the log book? Caught up with them on the way to Donnelly Mill at a ‘water feature’ (can’t remember the exact coordinates). They were riding ‘half days’ so taking things pretty easy (in my book), and planned to end the day at Donnelly Mill. They also told me that it was possible to stay there overnight, which was news to me. 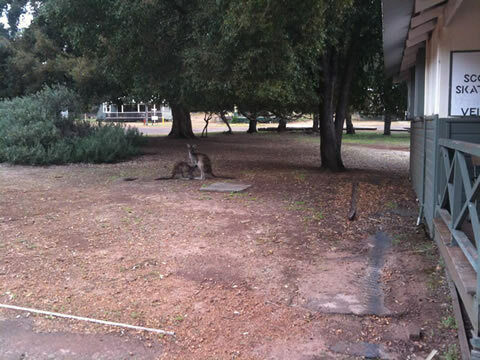 Had a chat for a while then headed off, assuming I would eventually meet them again at the end of the day at Donnelly River (which turned out to be the case). Not sure why this ‘billabong‘ is here, or whether it is natural or not, but the water would probably keep you alive in an emergency (of course you would likely want to filter/sterilise it first). Almost tempting enough to have a swim also, but it does look like a good place for a bunyip to live in, so beware. [Aside: another creature of the Australian bush, often mentioned by bushwalkers, are the fearsome and deadly dropbears. I have often warned newcomers of their potential danger. Recently my wife sent me a picture of an actual dropbear (warning, this image is a bit gruesome) that she found on the WWW (hey, if it’s on the Internet it must be true). Donnelly Mill is not marked as anything on Map 5, other than car access, so I was not too sure what to expect. 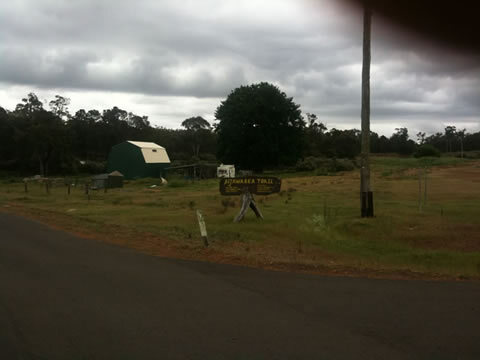 It is in fact an old logging town which has since closed down and become a sort of rustic holiday village. You can read more about it on their website or on Wikipedia. I arrived there about 3.30pm, and discovered an idyllic village in the forest, complete with kangaroos and a shop (see below). It turned out that this is really one of the overnight camp options you can choose on this section of the trip, and it saves riding the extra distance to Willow Springs (which is a basic camp site with pit toilets and tables, but no hut or tank water. Still quite nice if you like camping out though). So Donnelly Mill (or Village, which is what it is) was today’s end point as far as I was concerned. 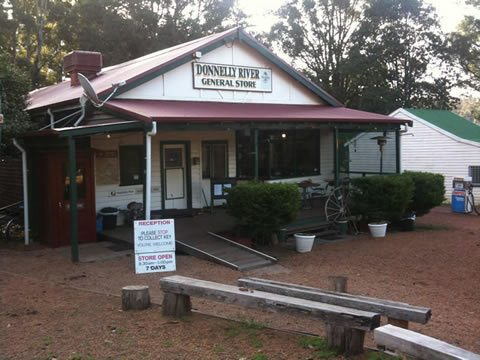 Donnelly Mill/Village is also quite Munda Biddi friendly and keen to support bikers. The General Store has a fair amount of supplies, plus satellite WiFi Internet (if you need it, $5/30min) and good coffee (the shop keepers have all done ‘barista’ courses). No alcohol though so it is BYO. There is also a lounge with satellite TV and a DVD player, if you’re desperate (not sure if you have to supply your own DVDs). Once again though, no Optus mobile phone access, but reasonable Telstra Blue Tick NextG access, depending on where you stand. 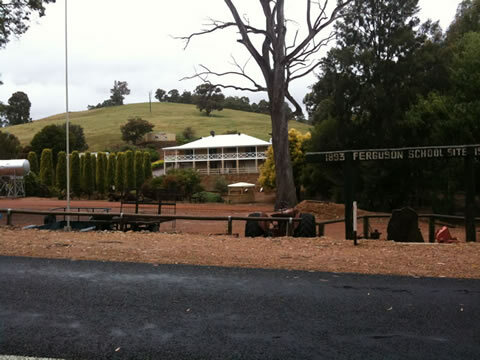 Accommodation (at the time of writing) was $25/night for a bunk in a dorm with a hot shower and kitchen (and electricity) in the primary school (no longer a real school). 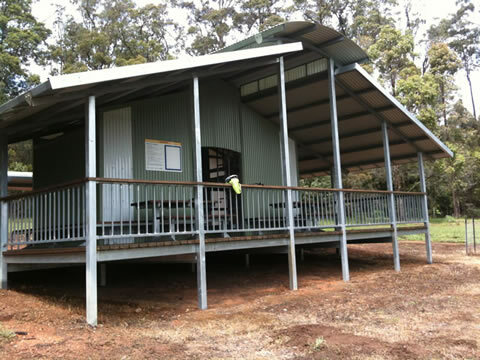 You can also camp for free in the ‘sheds’ at the school, which has an outside toilet and fireplace you can use. If you don’t want to pay the $25 you can have a hot shower for $5 if you want (but why not just stay in a dorm?). 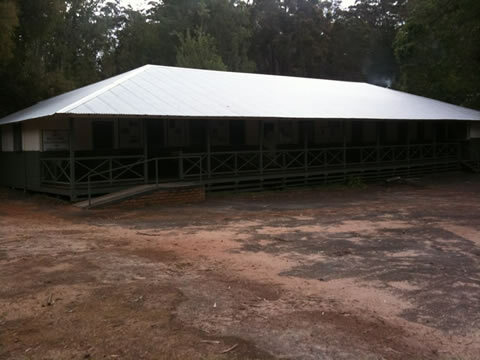 This is also an overnight stopover for the Bibbulum Track, but there is a separate (smaller) dorm section for Munda Biddi riders. The logic I think (as explained to me) was that the Donnelly Village management thought it would be better to separate the two groups. At the time I had visions of bikers and hikers fighting over who was better/tougher/more adventurous, etc, but hopefully it won’t come to this and the two can sleep peacefully side by side. While in the shop I was just about to hand over my $25, plus extra for a few supplies, when in walked a couple from Perth that I knew. Turned out they ‘owned’ one of the 30 or so cottages at Donnelly Village, so they invited me to stay the night at their place. Talk about coincidence!! So the first night included a hot meal, wine and a soft bed, really roughing it. It turned out that the village has quite a history (and I got the VIP tour). A few years back it was sold off and a group of 30 or so ‘parties’ bought free-hold title to the whole thing. Each party obtained ownership of a house, which they are required to renovate and rent out (and which they can also use), plus they effectively manage the whole thing collectively. Day to day management (such as the shop) is done by contracted employees. The whole arrangement is somewhat strata title-like, but with a lot more complications. There is too much history to go into here, but an overnight stay at Donnelly Village is certainly a highlight of this section of the ride. 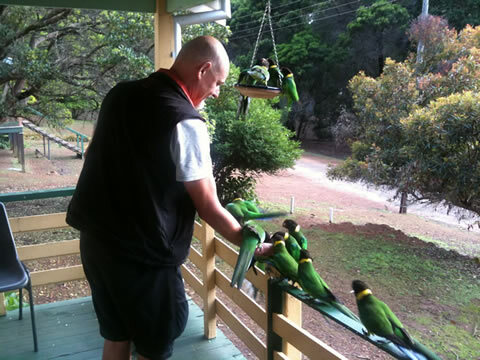 Started the day fairly early with a civilised breakfast on the veranda, feeding (or fending off) the parrots (which are actually either ’28s’ or ‘Port Lincoln’s’, both feral imports from South Australia). You leave Donnelly Village following the trail markers immediately below the shop, i.e. not via the entrance to the village,and then it is nice riding through the forest on single track and dirt roads, with some hilly sections. From Willow Springs some more dirt road riding through the forest. Some surprises this morning: almost ran straight over this guy sun-baking. 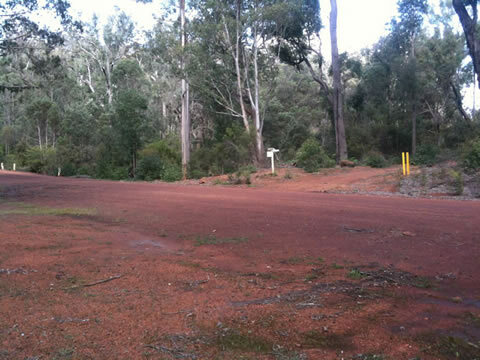 Eventually this section of the track leads onto a sealed road which you follow for several km’s into Nannup. Going north this turned out to be a long, (mostly) downhill, easy ride past a number of dairy farms. I was glad I wasn’t riding in the other direction. Lunched (is that a word?) 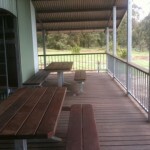 at Nannup in the local cafe, under the trees/vines in their outdoor eating area. Ate way too much – a hamburger and chips and choc milk. 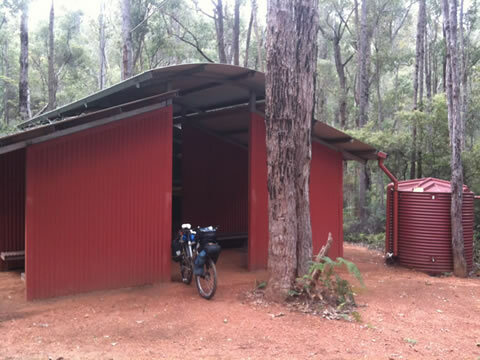 Eventually dragged myself back onto the bike for the trip north from Nannup to the next hut (Nala Mia) at Jarrahwood (not to be confused with Jarrahdale further north on the track). 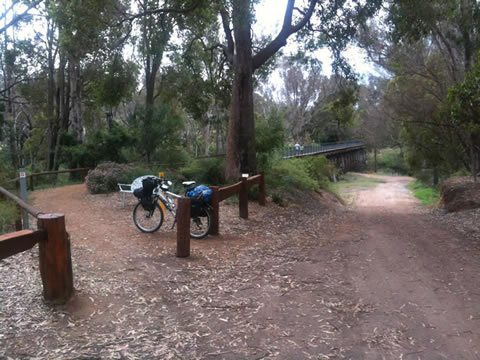 Leaving Nannup, you cross the foot bridge over Nannup River and then follow the Sidings Rail Trail for 26km to Jarrahwood, an easy and fairly interesting stretch. 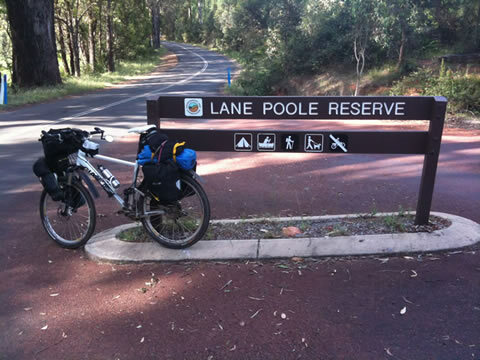 This seems to be a popular day trail for people/tourists based in Nannup, as I met a few people riding along the track from Nannup to Jarrahwood and back (it was Saturday as well). Most of the track is about the width of a (narrow) footpath composed of packed pea gravel, and on or following the old railway line. 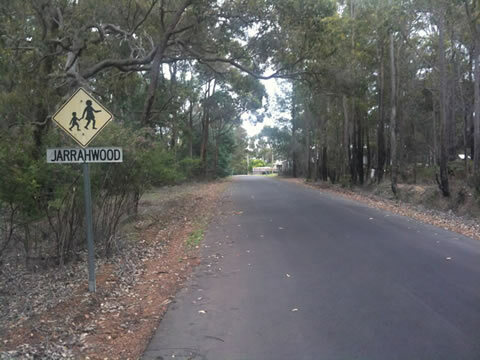 A pretty easy 26km, only the last section into Jarrahwood having any hilly bits (I don’t like up-hill much). Along the way I had the novel experience of racing (along the track) against a mother emu and chick, who I guess didn’t like the look of me. The run pretty fast so they left me behind (or so I though), but then suddenly I saw them coming straight at me, only to turn off into the bush at the last minute. Thought this was a bit odd, but then met up with another recreational biker coming from the other direction, which (I guess) explained their about turn. This incident also reminded me of a recent You Tube video I saw. Fortunately I came off better than the guy in the video. 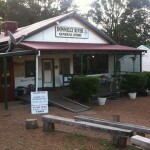 Arrived in Jarrahwood about 4.30pm (perhaps slowed down by the hamburger). 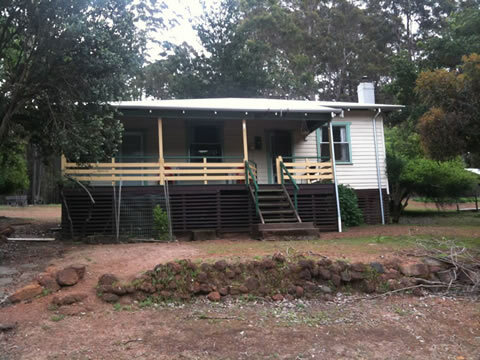 According to Wikipedia, “The town is named for the Jarrah Wood and Sawmills Company which operated in the area and operated a private railway from the district to Wonnerup, which was purchased by the Government in 1906″. 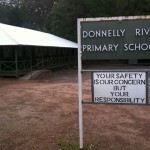 The town appears to be a semi-closed community, although different from Donnelly Mill. There is not a lot on the WWW I could find about it, although there is some information on display concerning the history of Jarrahwood in the town itself (which I didn’t bother to look at as I wanted to get straight to the hut. A bit lax in hindsight). 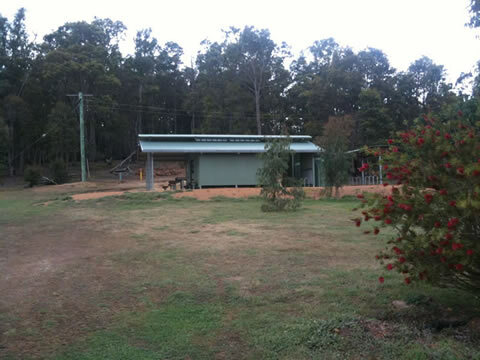 The hut itself is on the outskirts of the town on the rise near the forest, surrounded by open, grassed areas (and lots of kangaroos), but only a 100 metres or so to the nearest house. It is a bit odd listening to the kids playing, ‘home’ noises, etc, although maybe this was just highlighted by the expectation of ‘being alone in the forest in a hut’ (which is not the case here). The hut is a bit exposed so could be a bit wet and chilly if there was bad weather (note: only Telstra NextG phone access here). Had a pretty good night’s sleep, given the location of the hut (it’s a bit like sleeping in someone’s backyard). This turned out to be a pretty easy section, lots of single track through the forest, although a few hills (sorry, slopes) in the middle section, which were mostly on gravel roads, then on to the sealed Goodwin Rd for a while, then diverting back onto single track before arriving in Donnybrook. In some sections I was also diverted (onto roads) due to planned burn-offs. 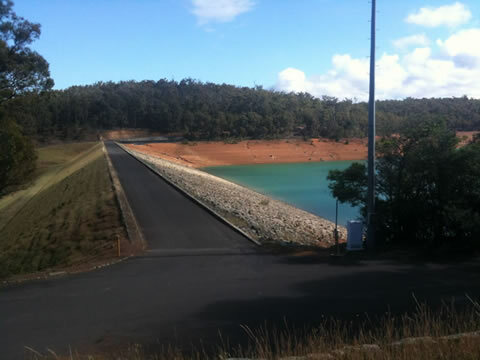 There is a great dam/swimming hole right on the track about half way (just past where you first meet Vernon Rd), where I had a quick dip and which would be perfect for a lunch stop (although you will probably get there before lunch). It also seems to be a popular spot for trail bike riders; however I had no problems with them. 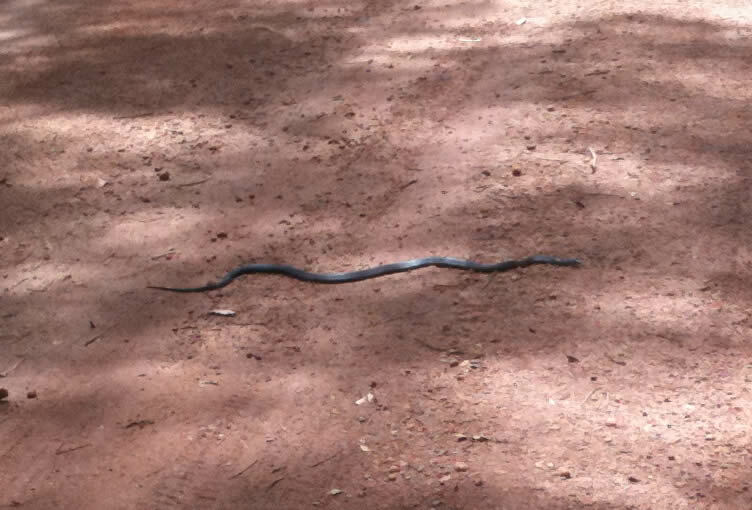 On the way I came across another snake on the road, or so I thought, but it turned out to be a common garden variety. 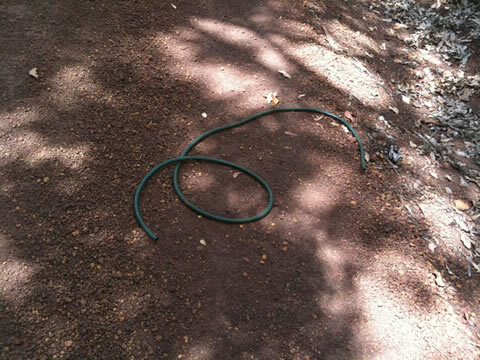 Another snake on the road?? There are lots of ‘Watch out for bike’ signs along the roads, but a popular ‘sport’ in these parts seems to be target practice with a shotgun. Not too re-assuring, but I guessed I was unlikely to be mistaken for a sign (and that it was a bit early in the day for spotlighting). Arrived in Donnybrook pretty early (about 1.30pm), so had to decide whether to keep riding or not. 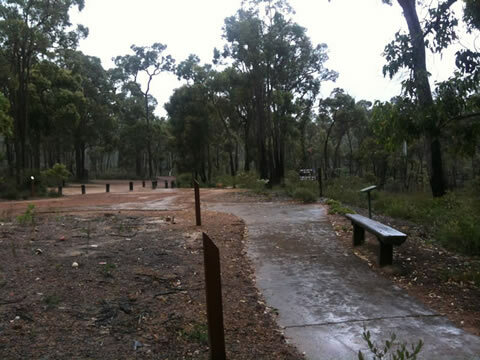 The next potential camping site or stop-over (other than Boyanup, which I knew even less about) was still a way off – Crooked Brook Forest – and this was an unknown quantity since it was actually only marked as a picnic area, and is not an official Munda Biddi camp (and I assumed, you’re not really supposed to camp there). So I stopped at the tourist bureau, which was closed (a bit odd for a Sunday I thought), however they did have a list of accommodation and contact details on the front wall displays. Apparently there is a camping site of sorts near the cricket oval, and you can pay (or whatever) at the petrol station (there are two petrol stations, so I am not sure which one it is). However I don’t really know anything about the camping option other than what someone wrote in the Nala Mia hut ‘Comments’ book, so you might have to find out for yourself). [Aside: I think I forgot to write in the ‘Logbook’ at Nala Mia hut, I may only have written in the ‘Comments’ book. But I was definitely there]. The backpackers on Bridge Street sounded good, but when I rang they were full-up. So I decided to go and have lunch and a beer in the pub (to replenish lost fluids) and think about my options. It turned out there are actually two pubs, side by side, on the main street. Now I wasn’t too fussed about which to choose, but the limiting factor was the bike and my gear (and you never know what you’ll find when you walk into a pub). So a beer garden entrance was the decider. Only the [email protected] (pub) seemed to provide this option, so I went round the back (entrance) to where there seemed to be a beer garden. No-one there (also a bit odd given it was a Sunday afternoon), but there was a grassed area with a table or two. So I parked my bike and went into the main bar and ordered lunch. So after lunch I asked if they had any accommodation. Turns out they had backpacker style rooms upstairs with bunks, and they were pretty empty, as the harvest was delayed due to the rain and cool temperatures. Only $25/night p.p. for a double room, which I could have on my own. So I had a look, and although basic, the rooms were pretty clean, with sheets, and there were hot showers (the bathrooms though were less clean). They also let me keep the bike in my room (although it was pretty treacherous carrying it up the stairs). I also had a Kindle e-book reader with me, so an afternoon spent reading didn’t sound too bad. [Aside: this is where a bit of local knowledge comes in handy. For those that live in Perth, Donnybrook is known for its apple orchards, although it has also developed to include wineries. It is a popular spot for backpackers who want to pick up a bit of cash during the harvest season by fruit-picking and orchard work]. 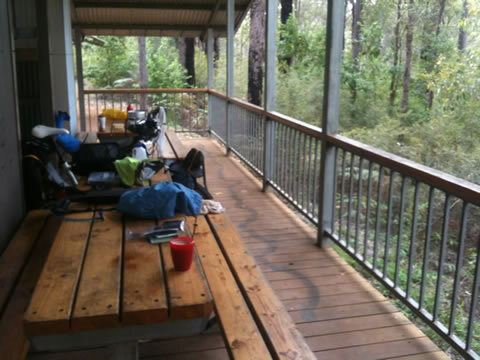 By this stage of the trip I was starting to feel a bit guilty, having stayed in a house at Donnelly Mill, and a pub in Donnybrook, so I was sort of looking forward to staying in a Munda Biddi hut again. So I left Donnybrook early-ish, about 7.30am, ready to ride to Nglang Boodja. 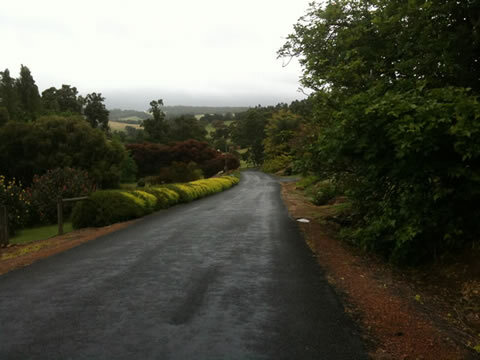 The day started with some easy, pleasant riding on back roads to Boyanup, then more back roads into the forest. 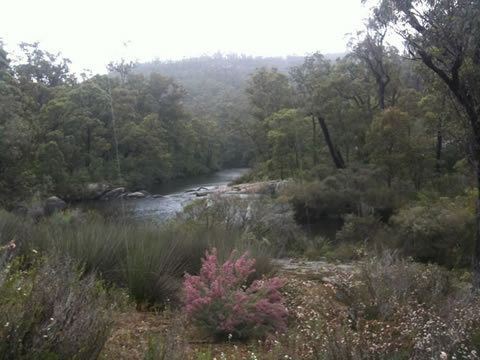 The weather though wasn’t looking too good (rain), but I eventually made it to Crooked Brook Forest mid-morning, just before the rain came (about 21km from Donnybrook). No-one there but me, and it was a pretty magical place in the forest. 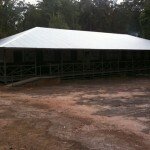 As you can see from the last photo, I took over the picnic shelter. Spent an hour there to have a late breakfast (skipped this in Donnybrook) and to wait out the rain. It is a pity it is not a formal camping area, but given the road access it is probably for the best (of course, I would think that a desperate bike rider could probably overnight here if need be. Toilet, water, shelter of sorts. Not that I would condone this). 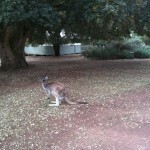 There is some, limited, Telstra Next G mobile phone access. 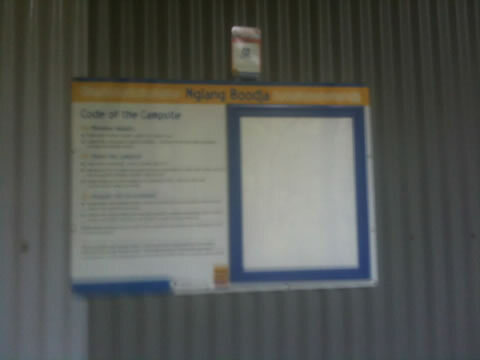 [Aside, a longish one: I forgot to mention that I lost my Map 4 in Donnybrook. Not sure how this happened, but I think it occurred somewhere between the Tourist Bureau and the pub (and I hadn’t even had a beer at that time). So days 4 and 5 were done without Munda Biddi maps, just following the trail markers. 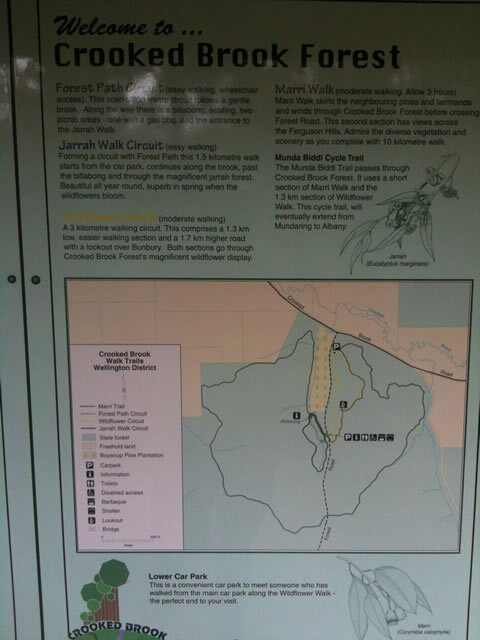 I did have a tourist mud map I picked up in Donnybrook, and this had the Munda Biddi trail marked (roughly) on it, plus major roads, and was pretty useful as a backup, if only psychologically. 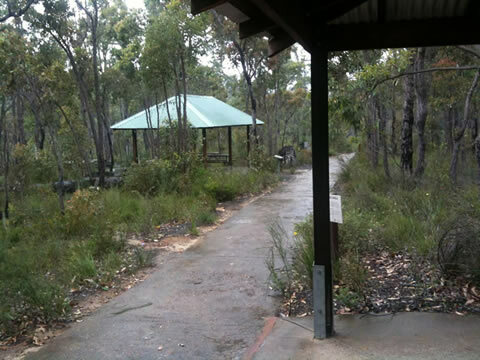 NOTE: doing the Munda Biddi Track without official Munda Biddi maps is not recommended. The trail markers are an excellent guide and generally well placed, but there are spots along the track where you also need to use your common sense, e.g. missing markers due to vandalism, detours due to prescribed burns, getting lost by not noticing important markers as you ride along; etc, plus psychologically it is useful to have some idea where you are or are supposed to be going. The maps are also an essential tool in regards to overall trip planning. Next time I will use my iPhone to photograph all my maps so that I have a copy of them in emergencies. Otherwise, simply having a photocopy backup might be a lifesaver. Since this trip I have also purchased the iPhone App MotionX GPS (on special for $2 at the time). This is a pretty good app in my opinion (but I am not going to rate it against other GPS type apps or devices). It is however an iPhone/iPad only app. I am not an Apple fan boy by the way, most of the time I use Windows 7 based computers. I just happen to have an iPhone 3GS, mainly because when it came out it was one of the first smart phones with a large touchscreen (my eyes are getting weary) and an easy to use GUI. MotionX (the full $2 version) allows you to save maps. So since this trip I have downloaded a good resolution copy of the WA South West – the MotionX Terrain map version. A large download at 1 Gb or so (so use WiFi not you mobile phone account) but pretty detailed. 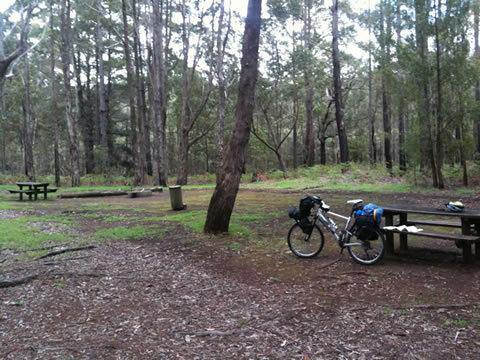 It even seems to have many of the WA bike trails on it already, including the MB trail as far south as about Nannup. I’m not sure how they got there, but I assume someone else has uploaded the track data to the WGS 84 datum that the MotionX maps are based on, e.g. see www.walkgps.com. The MB trail shown on the OpenCycleMap topo map at the www.walkgps.com website looks identical to that I now have on my iPhone. The problem with iPhones (and others?) is that battery life is CRAP (a technical term) when using GPS, so you need to be careful how much you use it (I actually had a couple of iPhone booster batteries that I bought on eBay, similar to this one. These give you a full iPhone charge and don’t weigh much/are small. Useful if you are away from power for a few days). The advantage of GPS is that it is not dependent on carrier signals, such as Telstra or Optus. I also have my iPh0ne mounted on the bike via a RAM Mount]. From Crooked Brook Forest there is some nice single track through the forest, until you eventually enter the Ferguson Valley. Then mostly sealed roads, but scenic (and hilly) riding through this picturesque farming area. Leaving the Ferguson Valley you enter the Wellington National Park. Nice riding in forest through Wellington National Park, a change from the rolling hills and farmland of the Ferguson Valley. About 2.00pm emerged from the forest into a DEC camp, complete with bunkhouses and associated facilities, which was unexpected. Spoke to the new owners, who happened to be standing around enjoying the surrounds. They informed me they were keen to get more bike riders to stay and also that the next hut (Nglang Boodaj) was only 15 minutes or so away (by bike). After some conversation I headed off (somewhat sceptically, as to how far it was) on the trail, and did indeed come to the hut after about 15 minutes or so of easy, mostly downhill riding. 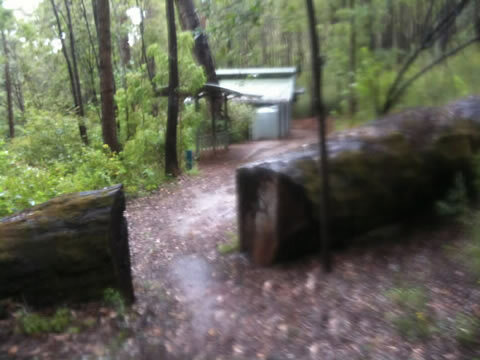 As you can see, from the blurry photo below, it had started to rain, and I arrived at the hut just in time to escape some reasonably heavy rainfalls. A beautiful spot in the forest. There is a massive tree that has fallen over directly downhill from the hut, apparently forming a natural bridge across the creek. A quiet (and alone) night spent at Nglang Boodaj. I did ring my wife on my Telstra NextG Blue Tick phone (no Optus access), who informed me that on the news it had been reported that there had been an escaped lion (just the sort of news you want to hear while camping alone in the forest). Fortunately she rang back to report that this had been in Darwin, so I felt reasonably safe after that (although there was still the Nannup tiger to worry about). Leaving Nglang Boodja you descend, via a number of switchbacks, to the Collie River. Following the river is pleasant, however there are lots of granite lumps and several rocky outcrops to traverse. Then you ascend up further switchbacks to the top of Mt ?, where you eventually leave Wellington NP. 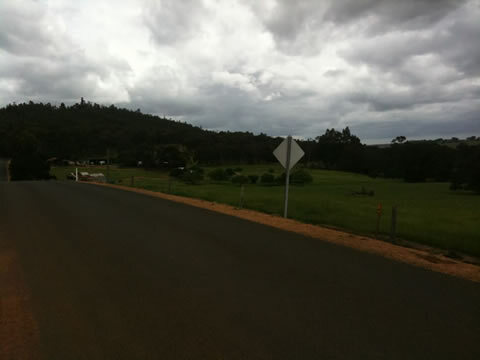 Eventually you cross the Coalfields Rd, a major highway into Collie. It may be tempting to ride straight to Collie via the Coalfields Rd (avoiding the backtrack trip into Collie, which is only shown on Map 3). However the road is fairly busy and doesn’t seem to have much in the way of a verge, so perhaps best left alone. Crossing the Coalfields Rd, you head north, eventually crossing the train line (a bit of confusion here as the obvious route is a dead-end, so watch out), before heading into the forest again for some nice riding. 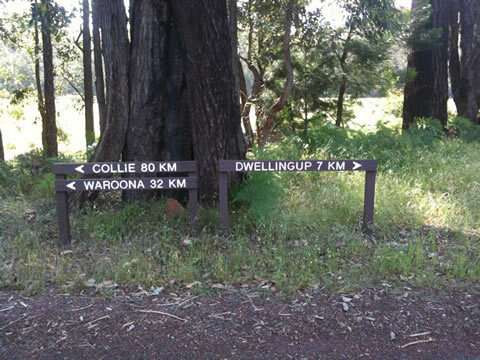 The diversion to Collie is well sign-posted, so don’t worry, but it is a bit dis-heartening knowing you have to ride these 15km back again the next day. However if you are doing the standard daily distances, there isn’t much else in the way of accommodation, etc, other than Collie. It is also a pretty easy and pleasant ride through the forest, however at the time most of it was diverted onto Mornington Rd due to burn-offs and other activities). 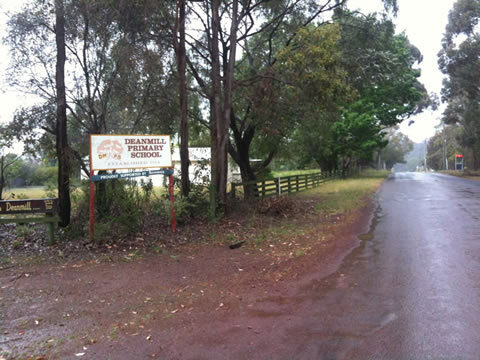 As you head into Collie, it may be worth following Harris River Rd straight downhill into the western side of town (which is where the Visitor Information Centre is, useful if you need to ask about accommodation), rather than following the signposted MB track (which takes you through the north-east section of town). You will probably follow the signposted trail out the next day anyway. 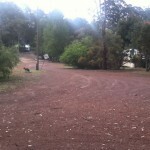 The Caravan Park was camping only (when I rang there were no cabins, all booked out due to the mine site and power station workers). I ended up staying at the Coalandria House Bed and Breakfast, close to the shops and main street. You are sharing facilities (kitchen, lounge, bathrooms) in an old colonial style 2 storey home, but the rooms are large, with fresh sheets and towels. [Aside: you pick whichever room is free, indicated by a key in the door, which is a bit odd. It is like walking into someone’s home and staking out a ‘free’ bedroom. My room even had a TV. 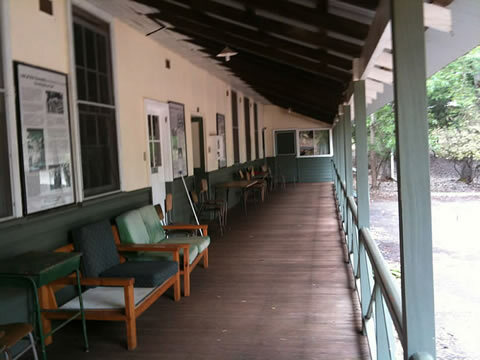 At the time some of the rooms were being rented out by a family from Qld who were all working on a revamp of the power station. Staying here was for them a close approximation to having a home, even if they had to put up with the occasional visitor. It is however bike friendly and safe. The backyard is secured, as is the rear entrance, where you can leave your bike. I wouldn’t worry about the ‘breadkfast’ component, just pay for a room and buy you own breakfast]. PS. the library also has cheap Internet access if you need it. 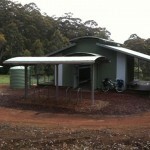 Today I started using the Munda Biddi map again (Map 3, as I had lost my Map 4). I began by back-tracking out along the signposted MB track from Collie, ascending though the outskirts of the town, till reaching Mornington Rd again, and then through the forest (again). Finally reached the track intersection to go either south or north (in my case). Today was spent with a lot of nice riding along forest tracks, although there were several serious ‘puddles’ along the way (due to the rain). A lot of the earlier sections were spent near to the mining developments, which gives one another perspective on the term ‘wilderness’. 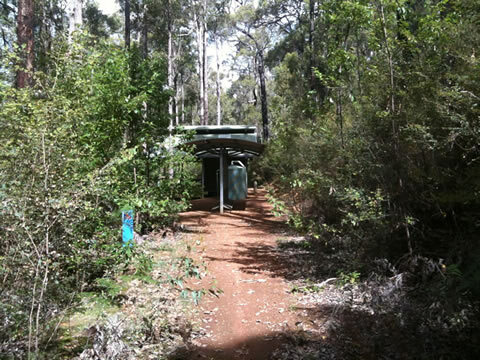 Yarri hut is another nice hut, isolated deep in the forest (similar in design and location to Nglang Boodja). Arrived there a bit wet shoe-wise, having fallen off in one of those (slippery) puddles I mentioned. Not much in the way of mobile phone access here. 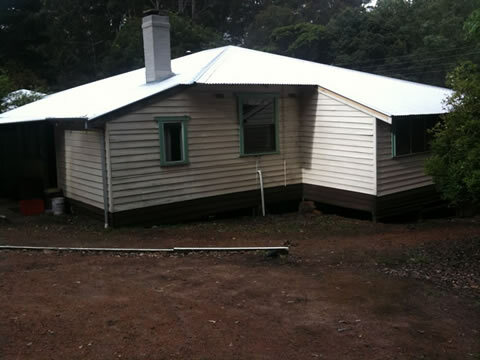 [Aside: A few km’s before Yarri hut you come to a powerline. Keep an eye out for the turn off to the hut, which is not very far along after reaching the powerline. I missed it and ended up riding up and down a few hills following the powerline (and then back again once I admitted defeat). Leaving Yarri Hut I set off for Logue Brook Dam, which seemed the next logical overnight stop. However I was not too sure what to expect as it is not an official MB hut/stop. 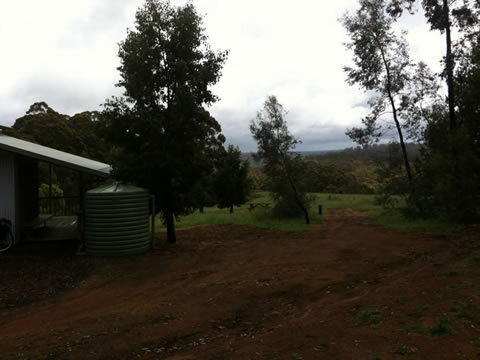 From Yarri you soon near the Stirling Reservoir Catchment area, skirting around this through the forest. Don’t be tempted to take any short-cuts through the catchment area, as there are numerous roads and without detailed maps/compass/GPS you could easily become lost. North of Stirling Dam you are back into the forest, after a diversion onto to Quindanning Rd due to controlled burn-offs. 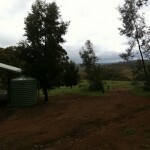 You eventually come to Logue Brook/Lake Brockman Dam, and the caravan park. A pretty easy day (unless you get lost). Lake Brockman Tourist Park is a nice spot (to spend the night), but is suffering somewhat from the low water levels in the dam and hence lack of water-skiers/campers. 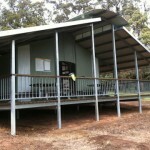 A basic cabin with electricity, microwave, fridge, etc, and access to the communal toilet/shower block was only $35/night. Not much in the way of supplies however, and it might be worth ringing beforehand to see if they are (still) open. Today was my last day and I was looking forward to the section from Bidjar Ngoulin Hut to Nanga Camp, as I had ridden this section several times. It was nice riding through the forest on a rail trail and also mostly downhill. Things started off well, over the causeway then following the road along the border of the dam. Eventually road past an Outdoor Education Camp, onto single track, then followed the ‘obvious’ route along the bottom of a large granite slab (past a MB sign). Into the forest though things deteriorated, with numerous red, yellow and burnt arrows pointing various ways, plus tape on trees, but no obvious MB markers. Spent some time backtracking but eventually gave up and road back to the granite slab (the last known MB arrow). At the arrow I surveyed the options. The obvious route was along the bottom of the slab, and the MB arrow sort of pointed in that direction (but not really in hindsight). The arrow actually pointed up the slab, and about 50m on there is an obvious MB arrow on a tree. Thus in my haste I had missed this and instead followed the obvious route, which is probably well used by the participants of the Outdoor Ed camp. Eventually back on track, I followed the track on and off the forest roads that form much of the track in this area (Zip Zag Rd/Nanga Rd). Some of it has been further diverted onto roads due to a large mining road development near the Zig Zap/Nganga Road intersection (once again reminding you how relative the term ‘wilderness’ is). 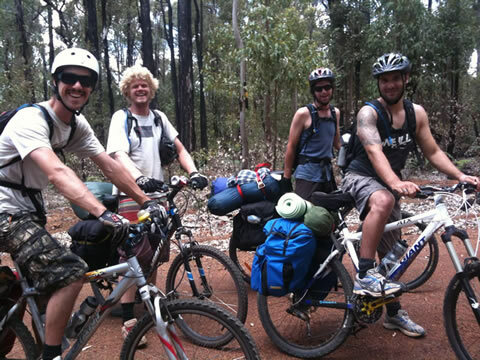 Came across these guys riding south from Mundaring, also on their last day. They very much reminded me of my New Zealand trip. They also looked as if they were having a great time, despite the various mechanical problems theyapparently had had. I also resisted telling one of them, who had bought his bike for $150, that one of my bike racks alone cost that much. But it is not how much something costs, nor how fast, far or hard you ride, it is the adventure and friendship you find on the ride that really matters. 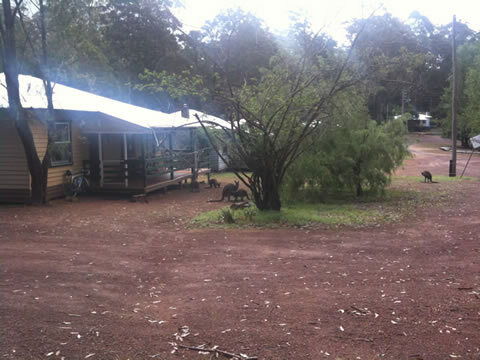 Eventually arrived at Bidjar Ngoulin Hut for lunch. 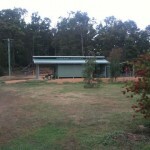 It is perhaps my favourite hut, maybe because of the small creek nearby. It is also the one I have most problems pronouncing. 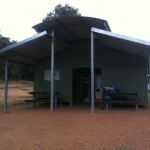 From Bidjar Ngoulin Hut it is a pleasant ride mostly downhill along the old rail siding to Nanga Camp and the Murray River. There were lots of people driving in to stay the weekend (it being a Friday afternoon) at the various camping spots that exist in Lane Poole Reserve. For me, it was then up hill (sorry ‘slope’) to Dwellingup, to meet my wife for my 55th birthday (today), and a weekend recovering in Dwellingup. 8 days and 400kms from when I last saw her. No punctures in 8 days, perhaps due to my tubeless tyres and Stan’s Sealant. As a final note, I would like to acknowledge Ben’s blog – Pedal Damn it! for some of the inspiration of this blog. Sadly, as reported in this post, he died in 2010 while riding his bike in Singapore, killed in a hit-run accident. 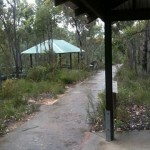 This entry was posted in Bike trips and tagged Bicycle rides, Munda Biddi Trail. Bookmark the permalink. Thanks for the report Chris, really gives a good feel for the ride. 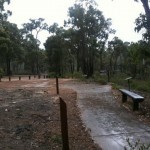 I’m planning on riding north-south from Mundaring to Jarrahwood, in late September. I would be interested in your thoughts about the weather at that time of year … likelihood of rain, day-time and night-time temps? 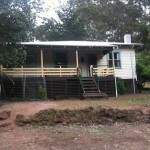 At Jarrahwood today, Monday, started from Mundaring on Sunday. To answer your questions, September should be perfect weather wise. Some warm days and likely some rainy days. Cold weather doesn’t bother me, but it could be cool at night. Expect a few puddles on the track if it has been a wet winter. Some of the climbs down and up out of the river valleys are likely to be tricky, I.e. Wet and or muddy and washed out. 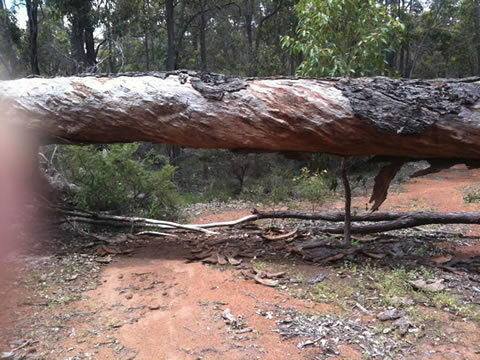 The climb down and out of the Canning river valley today had some tough bits. Days 8-10: Routeburn track, 2 nights, 3 days.